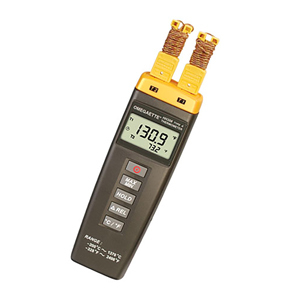 The HH300 Series is a low cost digital thermometer, small enough to fit in your pocket. They are available in single or dual input models with standard features such as min/max reading, reading hold, and both are °C to °F switchable. Their temperature range is from -200 to 1370°C (-328 to 2498°F). This low cost meter will read Type K thermocouple and accepts any subminiature Type K thermocouple connector.